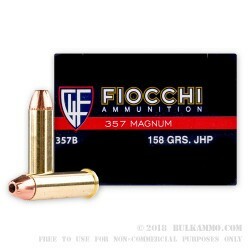 Fiocchi pistol and revolver products are top of the line cartridges built using all new components, to the highest level of detail, and with the strictest tolerances. 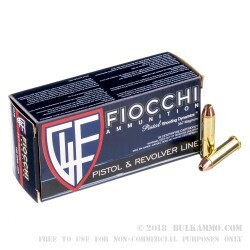 These Fiocchi revolver 357 Mag rounds are topped by 158 grain bullets. 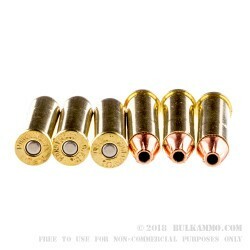 The JHP or Jacketed Hollow Points are lead core bullets that are surrounded by a thick copper jacket that has segmented lines at the tip to promote the “mushrooming effect” that is created when the round strikes its target. 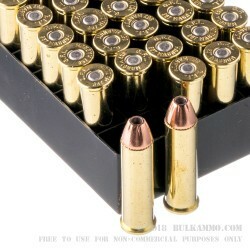 They come loaded into new, heavy straight walled, non-corrosively Boxer primed, reloadable brass cases. These rounds have a muzzle velocity of 1220-feet per second with a muzzle energy of 522-foot pounds. They are ready to go in a 50-round box, so transport is a breeze. Get yourself a couple of boxes for your newest revolver and take your family out for a day of shooting. 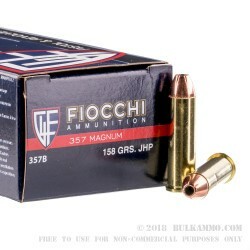 Designed in 1934 and subsequently introduced to the market in 1935, the .357 Magnum is a heavy hitting round with a long history of stopping bad guys. As we are aware, organized crime during the 1930s was widespread and Police officers needed more powerful loads that could go through the current body armor and vehicles. The .357 Magnum was designed in response to Colts development of the well-known .38 Super Automatic handgun round. The designers knew that Colts 38 Super Auto round could go through the personal ballistic armor technology of the time and could penetrate the all-steel car doors of the time, because its muzzle velocity exceeded 1000-feet per second. Smith and Wesson helped with the continued development of the .357 Magnum and was able to demonstrate the cartridge to Police Departments all over the nation.